View Our Reviews on Trip Advisor! Welcome to Sail Orange Beach and the Summer Season. We are excited about this upcoming summer and we are ready to take you, your loved one and family on the best "private" sailing charter on the Alabama Gulf Coast. Come along with Captain Ryan or Captain Randy on the fabulous sailing yacht, "Sailob" or "Attitude" We are the premier sailing cruise line serving Orange Beach and Gulf Shores, Alabama. Our sailing charters are professionally operated with an experienced crew. We offer convenience and save you time by allowing you to book your sailing charter online. We are also conveniently located in Orange Beach so it does not take long to get you offshore and sailing the calm seas of the Gulf of Mexico. We make your life easier than it was before you found us. We have a full line of complimentary snacks on board any of our sailing charters. So don't panic if you forgot a snack, a soda or water. We encourage you to bring your camera, bathing suit, and sunglasses. Flip flops are always optional with Orange Beach Sailing Charters. Our Sailing Yacht can accommodate up to 6 passengers, while sailing in Orange Beach and Gulf Shores. Sail Orange Beach specializes in small group sailing charters and family eco tours. Young and older couples also frequent our yacht to share romantic moments together. Your Kids will love our sailing charters. Children enjoy learning about local marine life like dolphins, sea turtles, seagulls, pelicans, cormorants, manatees and gain nautical knowledge about sailing the boat. When you charter your sailing trip with us, you are chartering the boat for only your group. We are Alabama's Gulf Coast's "Eco Friendly Sailing Charter"
Being Green is a good thing. Being Eco Friendly is better. Our Alabama Coastal Environment is pristine and so are the animals and fish that live in it. Orange Beach is the center of the mecca that runs from Pensacola, Florida, all the way to historic Fort Morgan and continues to Dauphin Island. Being conveniently located in rural Baldwin County, Alabama, gives small "family oriented" sailing businesses like us a chance to do our part. We are responsible when it comes to taking care of our environment. We are also accountable when it comes to providing professionally piloted sailing charters. 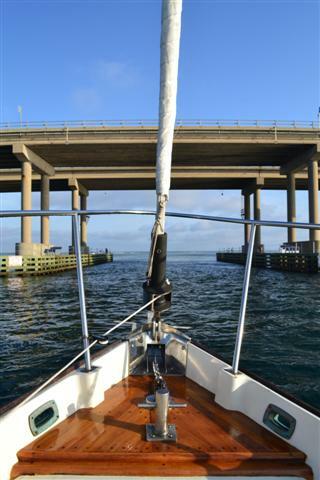 Other charters in our area use engines with their sails up to cruise you around. Sailing is a lost art and we show you how simple and complex sailing a yacht with absolutely no power on except our battery that runs our satellite radio. For those of you who want a peaceful and quiet sailing adventure, look no further than Sailob. We want you to hear the wind fill the sails and propel you along the coastal waters of Orange Beach, Gulf Shores and Perdido Key, Florida. Sail Orange Beach Yacht uses the wind as our engine. You get to enjoy the sounds of nature when our sails go up. Dolphin sightings are normal and are seen almost every sailing trip. Wild dolphins ride the bow of the boat, giving you a very up close experience with these gracious marine mammals.